House arrest monitoring using automated phone calls is a cost effective method of ensuring that individuals who are placed under house arrest are adhering to the guidelines established under their home detention program. Calls are automatically made to the detainee's home and questions are asked and responses recorded to ensure that the individual is at home at the time of each call. Calls and questions can be randomized and calls can be transfered to a case officer on a random or programmed basis for a spot check on the detainee. 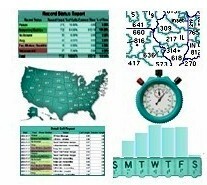 Database Systems Corp. (DSC) has provided calling programs and services for communities across the U.S. and Canada. Our services include phone message broadcasting that are used to check on the well-being of seniors living at home alone as well as checks on latchkey children. Our voice broadcast systems can deliver hundreds or thousands of house arrest calls in just minutes! House arrest, also known as electronic monitoring or home detention, is the legal term used to define a penalty imposed by law to a person who committed a crime and is condemned to stay inside his house. Home arrest is an alternative to jail time, often used for minor crimes or for teenagers who cannot be taken to an adult correctional facility. House arrest is also an option in places where the cost of maintaining a prisoner has escalated to a point where the government cannot longer sustain additional inmates. In any case, only minor offenses can be punished with house arrest, as major crimes always require jail time. Contact DSC to learn more about our house arrest and home detention phone solutions. Home Detention Calling - How Does It Work? 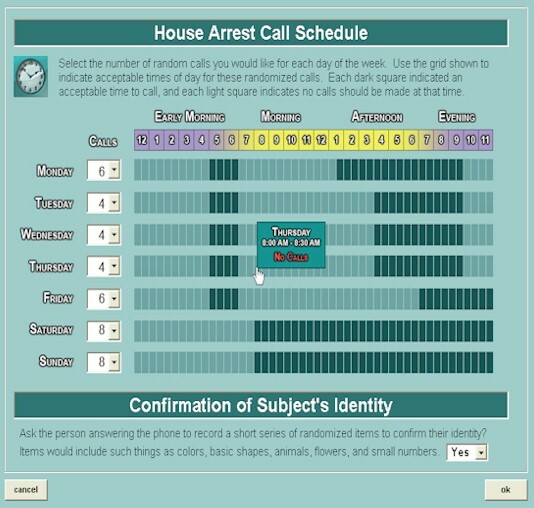 The DSC House Arrest monitoring program is easy to setup and administer. Detainees are enrolled by a case officer or administrator using an online maintenance program. Random calling periods are identified as well as the frequency of calls. A contact list is established to identify who to notify if the enrollee does not respond to the call (or if the call is not answered correctly). Voice recordings of those acknowledging the calls can optionally be required to ensure the HAI is the actual person under confinement. Verification is accomplished by instructing the HAI to say various items selected at random by CARE system from a customizable pool of items stored on the system. These recordings are archived and available for review, classification, and reporting by the administrator. Additionally, the HAI can be required to call the CARE system daily or weekly to determine if their assigned group is required to report for random drug testing. If a call to a home detainee is not answered or if the system cannot positively identify the individual answering the call, several steps can be taken. The detention officer can be notified immediately. Reports can be generated describing the result of each call so that case officers can determine if the detainee is following the restrictions dictated by the house arrest conditions. Custom phone scripts can be developed and home detainees must interact with our phone service by making touchphone selections or by having their responses recorded and analyzed. The Home Detention monitoring service can also be used to notify individuals of random drug testing as prescribed by the terms of their arrest and detention program. This simple program randomizes calls to individuals and notifies them when they are required to take a drug test. If selected the individual is instructed to report to a drug test center for sampling. Contact DSC to learn more about our house arrest calling systems.